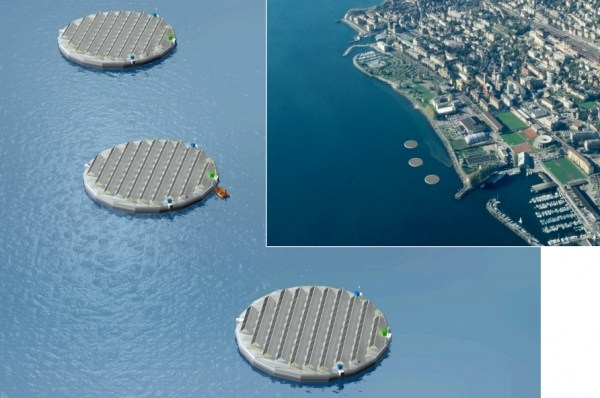 Swiss scientists have devised a remarkable technology for floating islands of solar panels, and three are set to launch in beautiful Lake Neuchâtel this summer. When it comes to renewable energy, it seems that islands are definitely the future. 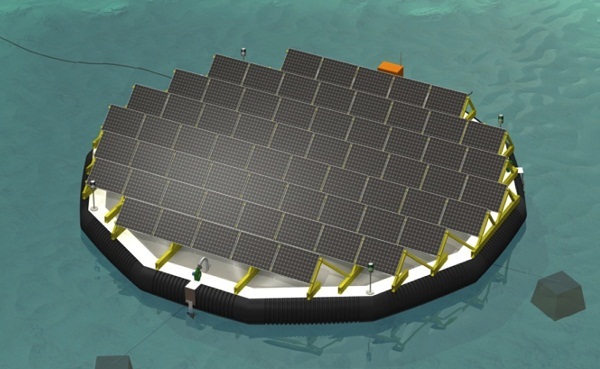 This at least according to two Swiss companies, Nolaris and Viteos, who have partnered to develop ingenious floating “islands” covered in photovoltaic panels. Renowned for their superior mechanical skills, it’s no wonder that the Swiss were the first to invent this simple-yet-elegant solution for generating inexpensive CSP (concentrated solar power). Measuring 25 meters in diameter, each island will be covered with 100 panels and form a test case for the effectiveness of water-based solar energy systems. According to Wired magazine, the creative and space-efficient idea has been under development since 2008, and is now ready to implement on a test basis. The Lake Neuchâtel installation will serve as a laboratory for studying the most effective ways to harness solar energy on water. For such a futuristic technology, the mechanism behind it is as old as the steam engine, which powered boats and locomotives throughout the 19th century. Water heated by the island’s panels turns to steam, sent through a pipeline to turbines onshore, producing clean and renewable electricity. One of the most creative elements of the project is that, like a sunflower, the islands will rotate throughout the day to maximize the amount of sun reaching the panels. Anchored by cables to the lakebed, they will have a rotation of 220 degrees at a 45 degree incline. The late researcher Thomas Hinderling, a pioneer in the field of microtechnology at the prestigious Centre Suisse d’Electronique et de Microtechnique (CSEM), first sparked interest in solar islands when he stated that, scaled to a mile across, they could potentially generate 190 megawatts of power at a cost far lower than current systems. The United Arab Emirates was the first country to leap on board the innovation; in 2009, the UAE government spent US $5 million funding a scaled-down prototype of 100 meters across. Providing that the technology could compete with the cost and reliability of electricity, the UAE would look to use it on a widespread basis. For Switzerland, it’s just one more technological marvel to be proud of. “It’s the biggest precision mechanism Swiss technology has ever made,” described CSEM’s Dr. Hamid Kayal, who ran UAE solar project. If the islands work effectively in the less-sunny climes of Europe, it could also be one of the country’s most important innovations.